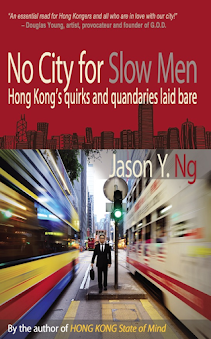 I grew up in a small flat in Hong Kong. To keep our shoebox of a place organized, my parents gave each of the five children a drawer to store their earthly possessions. Everything I owned growing up – coloring pencils, comic books, a secret stash of Haribo extra-sour cola bottles – had to fit inside a space roughly the size of a briefcase. And everything did. Throughout my childhood, that drawer was my whole life and my whole life was that drawer. When I left for boarding school in my teens, I emptied my belongings into a bag, packed a few pieces of clothing and went on my freewheeling way. Twenty some years later, things cannot have been more different. The age of owning just one – one backpack, one pair of jeans, one Casio digital watch – is long gone. My current flat, though bigger than the one I grew up in, is bursting at the seams with stuff. Just stuff. I have two iPads, three wine buckets and six area rugs. My kitchen is a Noah’s Ark filled with gadgets I use once or twice a year. Whatever the difference is between a blender, a juicer and a food processor, I have at least one of each. Over the years, I have managed to amass nearly a dozen miniature Eiffel Towers – in the form of key chains, fridge magnets and snow globes – which I had inadvertently purchased myself or reluctantly received from friends. Then there is my closet, that Ninth Circle of Inferno. Twice a year, I change out my wardrobe, putting away off-season clothes and swapping in things to wear for the coming months. I went through the Great Migration just last week. By a quick count, I own nine pairs of jeans, 16 polo shirts and 26 pairs of shorts. 26 pairs of near identical shorts! Yet, like most people, I only put on the same couple of favorites and complain I don’t have anything to wear. And so I keep on buying more. To make room for the new, I give away anything I haven’t worn in a year. That makes my brother Kelvin, who wears the same size as me, the primary beneficiary of my shopaholism. 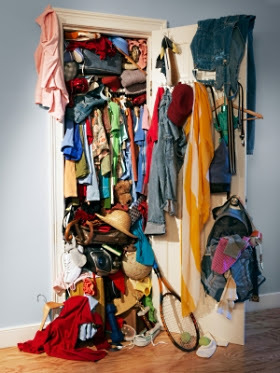 Does your closet look like this too? I have to wonder: how did I go from the wise kid who lived by Mies van der Rohe’s motto “less is more” to this out-of-control packrat who hoards like Scrat in the Ice Age films? A big part of it is basic supply and demand. In the two and half decades since the halcyon days of my youth, consumer goods have become much more affordable. 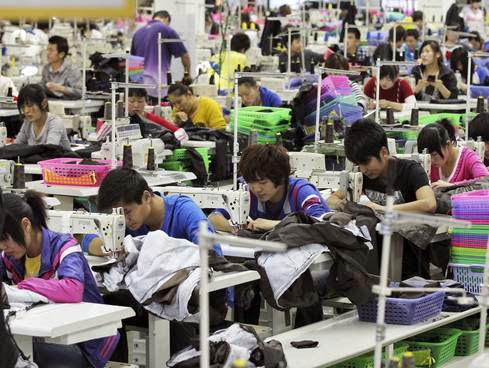 Cheap labor and economies of scale in China – the World’s Factory that manufactures 90% of the planet’s personal computers and 60% of its shoes – have driven down production costs and pumped up our purchasing power. Whereas worker bees a generation ago would think twice before investing in a winter coat, impulse buyers these days grab one in every color without batting an eyelid. When a polo shirt costs less than a beer, shoppers can binge at H&M or Uniqlo like it is an all-you-can-eat buffet. On a deeper psychological level, being surrounded by things, especially nice things, gives us a sense of security and self-validation. 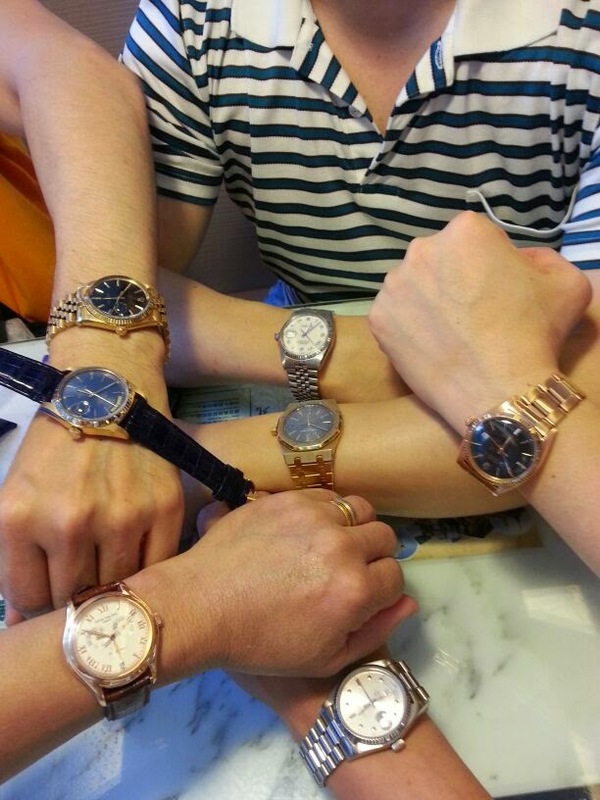 Rolexes and Birkins are as much a reward for our hard work as they are wearable milestones that mark our progress in life. Furthermore, we buy in order to fulfil an emotional need. One of the reasons I dropped a silly sum of money on hiking gear – headlamps, titanium walking sticks and a trekking watch with a built-in barometer and altimeter – is to compensate for not getting out enough. The less we do, the more we must own. 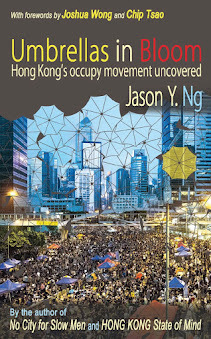 What we own can end up owning us, warns Tyler Durden, underground boxer and anti-materialist in the movie Fight Club. I don’t need to be a soap salesman to know the truth in that. With my flat filled to the brim with clutter, I had to rent a 50-square-foot locker in a remote storage facility to house my junk. That means month after month, good money is thrown after bad simply to keep things out of sight and out of mind. As a watch collector, I dutifully polish and hand-wind my timepieces every week. A spate of burglaries in my building last winter gave me a panic attack and prompted me to purchase a safe to keep my collection out of harm’s way. Then there is the wine vault to store my prized Bordeaux and a dry cabinet to house a full suite of camera lenses. Little by little, I become a glorified security guard watching over possessions I never thought I needed and sometimes forget I have. I can only imagine what an indentured servant one must feel to own a 60-foot yacht or a 15-room estate, no matter what bragging rights they promise. 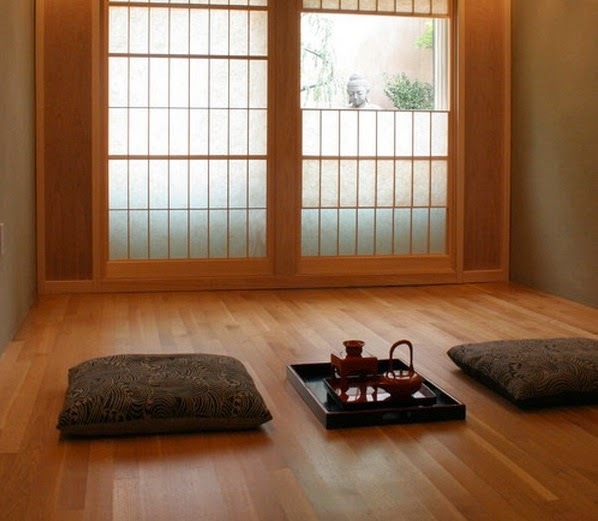 The 21st Century epiphany that we can live more by owning less has spawned a minimalist movement in the developed world. In the United States, marketing director-turned-life coach Dave Bruno started a “100 Thing Challenge” in 2007. The idea is to pare down one’s life to 100 items and get rid of all the rest. It takes courage to let go, for even family heirlooms and spare underwear are fair game. But the sacrifice is worth it, says Bruno to his disciplines, because going from riches to rags allows us to hop off the middle class treadmill and focus on what really matters: family and friends. The campaign has put Walden, Henry David Thoreau’s treatise on simple living, back on the national bestseller list. The notion that simplicity is the ultimate sophistication has its appeal. Downshifting is both financially smart and emotionally liberating. It cuts down unnecessary expenses and frees our minds from mundane thoughts. But does it really? Critics of Bruno’s challenge are quick to point out that living with less can be expensive and stressful. To maintain a minimalist existence, we may end up spending more, for instance, to replace useful things we have chivalrously thrown out. We rack our brain trying to decide whether to use our precious quota on a coffee machine or a toilet brush. 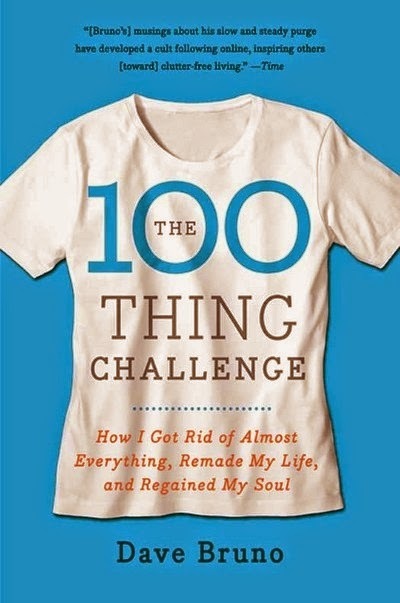 The 100 Thing Challenge, it seems, has simply replaced one existential obsession with another. In the end, we cannot achieve happiness by owning either too much or too little. True luxury, after all, is about not having to think about these questions in the first place. There is nothing wrong with being materially comfortable, as long as we are cognizant of what earthly things can and cannot do. Life gets more complicated with each generation and that’s the way it will always be. 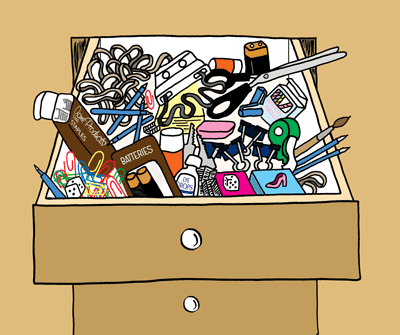 I can never go back to living out of a drawer – nor do I want to. Still, I concede there is something to be said about decluttering and reducing waste. I have devised a simple trick: I will take pictures of my bloated closet and storeroom and look at them each time I take something to the cash register. The stress of not knowing where to put my new purchase will quell my urge to buy. The money I save will then go toward an early retirement fund. It is a win-win proposition that doesn’t require hawking heirlooms or recycling dirty underwear. 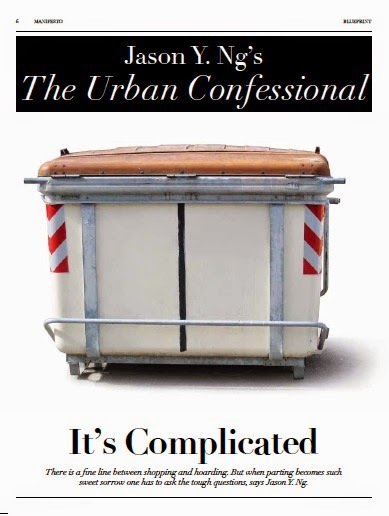 This article was published in the May/June 2014 issue of MANIFESTO magazine under Jason Y. Ng's column "The Urban Confessional."